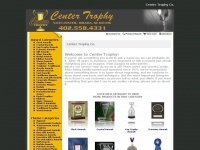 The web server used by Centertrophy.net is located in Vancouver, Canada and is run by Library Online Inc.. The server runs exclusively the website Centertrophy.net. The Centertrophy.net websites were developed using the programming language PHP and served by a Apache server. XHTML 1.0 Transitional is used as markup language on the webpages. The website prohibits search engines and webcrawlers using the description of the website from the Open Directory project. Other actions by webcrawlers and bots are allowed.